Company/Released : Southwest Technical Products Corp.
History : 04/28/2001 : Given 3 systems and boards. I just picked these up from a friend. Have to clean them up and look to see what all is there. Hope to have at least one up and running soon. Need drives, doc, software or anything else you might have to pass along to me that would help. I used one of these in a computer Explorer Post at NASA during High School. I'd like to pick up any of their systems now so if you don't need yours anymore, email me. You can check out this old ad for their Multi-User System but it is 139k so it might take a few seconds. 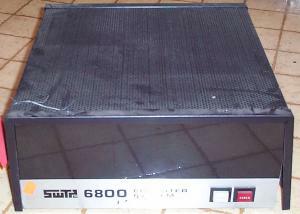 SWTPC 6800/6809 Emulator - Use IE as Netscape has problems with this page.